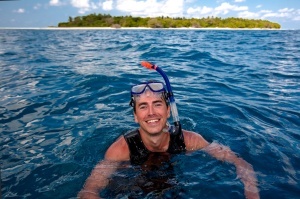 Adventurer and bestselling author Simon Reeve has travelled in more than 110 countries and has been around the world three times visting little-known regions for his BBC TV series Equator, Tropic of Cancer and Tropic of Capricorn. His most recent adventure 'Indian Ocean' took him through 16 countries and is currently being screened in the UK on BBC2 on Sunday nights at 8pm. When he isn't trekking the globe Simon lives in London with his wife Anya, who gave birth to their first child during a break in Simon's Indian Ocean journey. 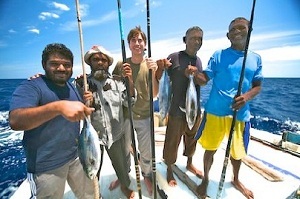 What can viewers expect from your new television show, 'Indian Ocean'? It's certainly the most exotic and extreme adventure of my life. We started in South Africa and worked our way up the east coast of the continent, then around India and back down through Indonesia to finish a few weeks ago in SW Australia. We visited some of the most glorious places on the planet, including the Seychelles, Mauritius and the Maldives, and then at the other extreme we found ourselves on the frontline in Mogadishu, Somalia, with a sniper shooting over our heads. We blend history and current issues into my travelogue, so I learn more about the places that I'm visiting, and hopefully viewers do as well. It really was an amazing adventure, and of course it's been beautifully-shot by Jonathan and Craig, our two magnificent cameramen, who filmed roughly half each and who've been hanging off boats and out of choppers, cars and trains as well as spending hours walking backwards while I natter away endlessly to the camera. You visited 16 countries in this new series - which was your favourite? Such a tough one. Every country we visited was spectacular and special. But I'm a big fan of Bangladesh, because although it's poor and packed the locals are warm and inspiring. They don't have much, and they're hammered by the Indian Ocean flooding in on one side and the meltwater from the Himalayas eating away at their land, but they struggle, adapt and survive. I'm also a huge fan of Australia and Australians. We kept meeting rugged Outback types who looked like Crocodile Dundee, but then we'd discover they had a PhD, or were a world-famous herpetologist. They're great characters. On this journey you 'encountered pirates, dived with sharks, went underwater spear-fishing, stumbled into a seedy drug-den, and had close encounters with the amazing wildlife of the Indian Ocean' ... does the simplicity and safety of a week-long holiday sitting by a pool ever appeal to you? Maybe for a day or two. But then I get restless and want to get out and about and explore! To be honest I feel that life is too short to waste topping up a tan, and I want to have experiences that will carry me through the years. I like learning more about the places that I'm visiting, and I think it makes for a more rounded experiences and a more memorable adventure. What is your first travel memory? Our family holidays were to Studland Beach in Dorset, which is still one of the best in Britain. We'd make sandcastles and muck about on a cheap dinghy. Great fun. We didn't fly but we went abroad on a couple of camping holidays, which were incredibly exotic. We motored through France and Switzerland to Italy. It was like visiting another planet. Have you always had a great sense of adventure? I've always loved seeing what's on the other side of the hill, but I was never one of those teenagers who stowed-away on a plane or went Inter-railing around Europe. Travelling for TV has encouraged me to really get out of my comfort zone, and I've loved every moment of it. I was free-diving with a dozen manta rays ... I almost forgot to surface to breathe. The memory is burned into my brain. Tough one. I've been very lucky. Every single day we're filming my journeys I'm having experiences that I will remember forever. But there was one moment when we were filming in the Maldives and I was free-diving with a dozen manta rays coming towards me in a perfect line stacked one on top of the other, all of them filter feeding. I almost forgot to surface to breathe. The memory is burned into my brain. What has been the most inspirational place you have visited? Somaliland in the Horn of Africa. It's an amazing country, with democracy, traffic lights, its own currency, stability, low corruption, uniformed policemen and a minister for tourism. It's home to the most significant Neolithic rock-painting site in Africa, with scores of remarkable images that show the ancient inhabitants of this land worshipping cattle and venerating pregnant cows. But it's not recognised as a country by any other major nation in the world. So it has no seat at the UN and everyone thinks of it as being part of chaotic Somalia. Somalilanders have built a functioning, safe country with very little help from the outside world. What they've achieved is truly inspirational. I have a long list! I'd love to go to Japan, Iran, Russia, Costa Rica. If I had to pick one it would be Turkmenistan. We tried to get in there a few years back when filming a series where I travelled through the Stan countries of Central Asia, but Turkmenistan kept refusing us Visas. After London, where I was born and bred, probably Istanbul. East meets West there, as we all know, and there are great restaurants and a real buzz about the place. But it's the history that really gets me. Hagia Sophia is one of my very favourite buildings in the world, and I love the fact there's graffiti carved into the stonework there by a Viking that says, basically, 'I woz here'. A Viking! What does 'luxury' (in relation to travel) mean to you? The very, very, very rare times we get upgraded! Luxury? Travelling for the BBC?! We're on a budget when travelling for the Beeb. Quite rightly, of course. But we were lucky enough to stay in a couple of spectacular resort hotels in the Maldives, at vastly reduced rates, because we were filming. At one of them they gave you a bicycle with your initials on the front, and there were scented flares lit around the island. I was very impressed, and immediately started thinking about internet businesses I could found that might get me back there. Apart from family and friends, what do you miss the most when filming away from home? Radio 4, sleeping-in late, pubs. I take tea-bags and Marmite to liven-up the awful breakfast we often get in crappy guesthouses. Local music. I did go a bit mad in Mogadishu on my first trip to Mogadishu a few years back, and I kept playing Mr Brightside by the Killers as we drove around in a 'technical', a pickup truck with an anti-aircraft gun on the back. Torch, notebook and lots to read.